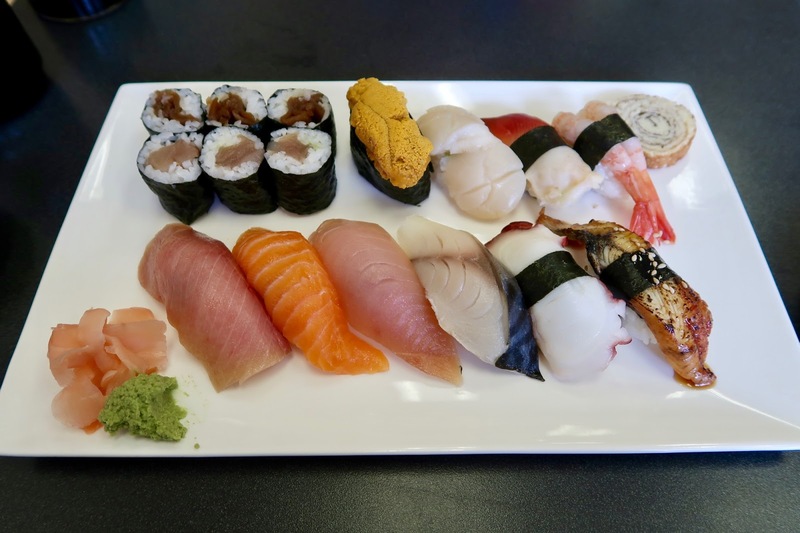 Sushi Bar Kilala is perhaps one of the most understated sushi bars in Greater Vancouver. Despite serving sushi that rivals locally acclaimed places such as Sushi by Yuji, it typically does not see many customers on any given day. Its hole-in-the-wall appearance does not really help. However, Puzzlefighter and I both knew about Sushi Bar Kilala's merits, so we arranged to have lunch there together. Unfortunately for me, Puzzlefighter claims that he only remembers appointments when they involve good-looking girls, and sadly, I don't exactly fit that description. Needless to say, it took some reminding for this sushi adventure to happen. Once inside, we were greeted warmly by the authentic staff. Inside, the decor is very basic and does not look like much more than a take-out place. It looks just about as fancy on the inside as it does on the outside. The menu stays true to the restaurant's name and includes very few items besides sushi and sashimi. Surprisingly, I have never had Futomaki until now, even though it is such a common roll. Those fancy rolls and Aburi choices on the menu always get the better of me. The Futomaki here came with shiitake mushroom, egg, spinach, kanpyo (cooked gourd), cucumber, and sweet fish powder. 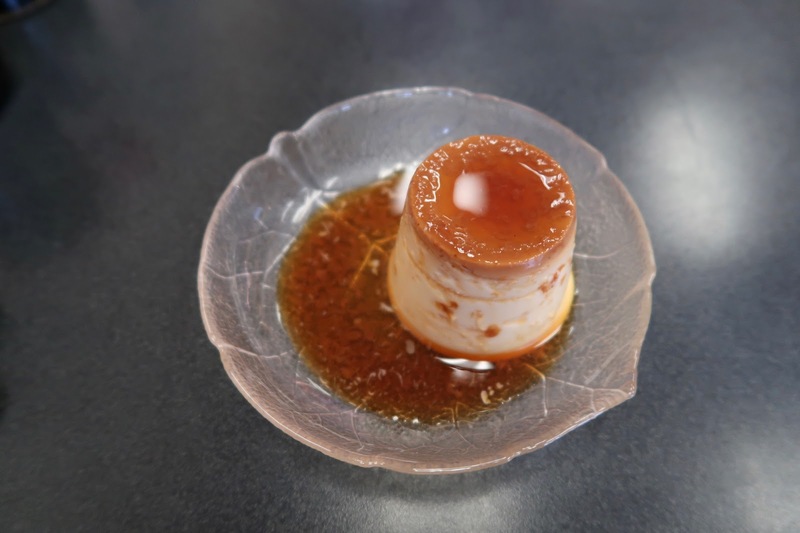 The roll had a homemade feel, with the sweetness of the tamago being one of its most prominent features. The mushrooms provided a well-rounded, savoury flavour to the roll, and I enjoyed how the rice was not packed too tightly. 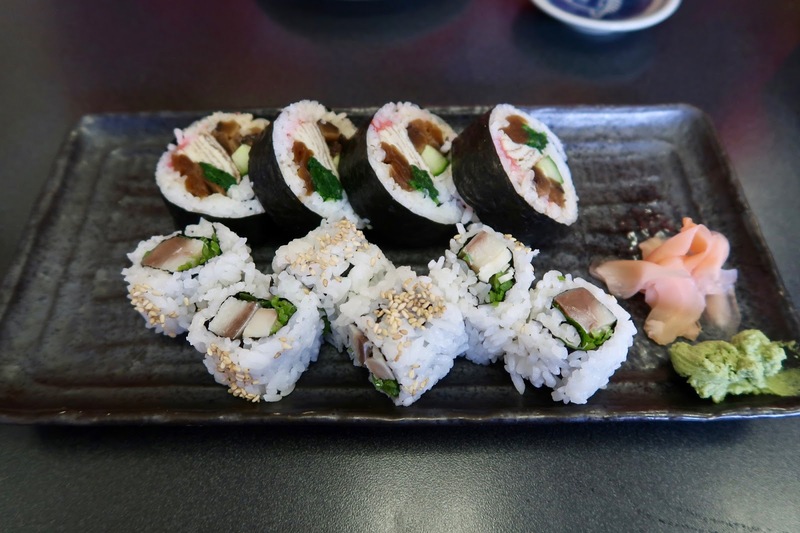 On Puzzlefighter's recommendation, we got the Negi Saba Shiso Roll (pickled mackerel, green onion, and oba leaf), which was also successful. It came with generous chunks of saba, and the light application of wasabi gave the roll a nice moderated spicy kick. Next, to get a sample of their fresh seafood, I ordered the Deluxe Nigiri Combination. More importantly, I ordered this to make my Snapchat friends hungry, because nothing says "bon appetit" quite like a colourful array of beautifully plated nigiri sushi. The Deluxe Nigiri Combination typically comes with Kappa Maki (cucumber), but since I'm "just a child" (a reference to Episode #162) and not a fan of crunchy vegetables, I substituted it with Kanpyo Maki (cooked gourd) instead. The Kanpyo Maki had a rich flavour somewhat like that of mushrooms. 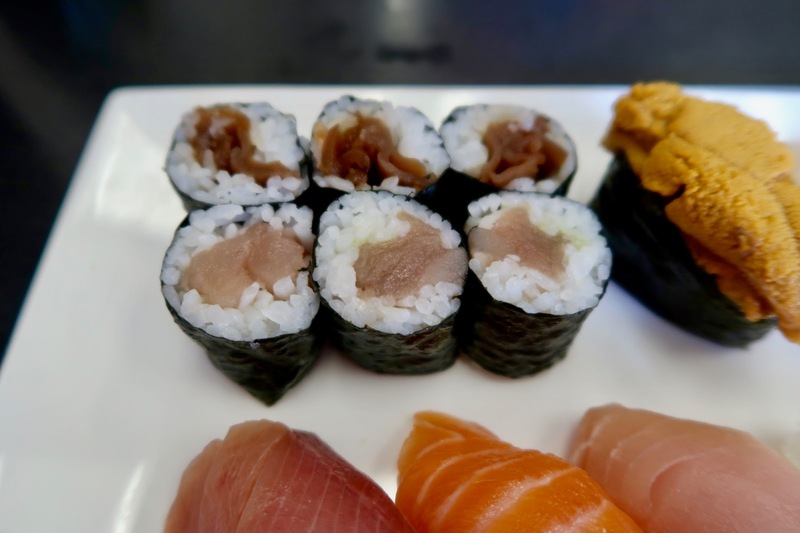 The Tekka Maki (tuna) contained soft tuna, which was slightly overpowered by the wasabi. With the uni (sea urchin), we were in for a treat as we learned from the sushi chef that the uni had just arrived earlier that morning. 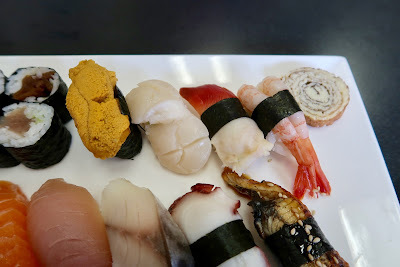 There was a generous amount of uni in the nigiri, and it was very rich and creamy. The sushi rice was well-packed and had ample flavour. The Hotategai Nigiri (scallop) had a sweet flavour and a very slight tinge of the stringiness typically found in cooked scallops. The Hokkigai (surf clam) had a nice rebound, though it was rather thin and accompanied by too much wasabi. The Amaebi Nigiri (sweet shrimp) had a pleasant, sweet flavour, while the Tamago was soft, fluffy, and cake-like. Moving onto the second row, the Hamachi Nigiri had a soft, smooth texture, though it tasted slightly salty. 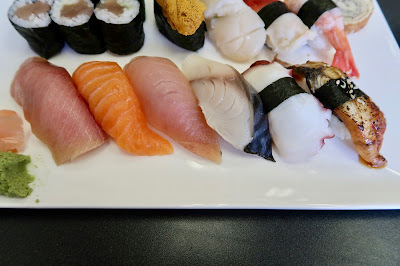 Both the Salmon Nigiri and the Tuna Nigiri were fresh and featured pleasant, soft textures. The use of a shiso leaf in the Saba Nigiri helped balance out the characteristic fishy flavour of saba, and I liked how the saba was not too salty. The Tako Nigiri featured too much wasabi, but the tako had a good amount of chewiness, and the Unagi was soft with an excellent torched flavour. One of my favourite things to get at Sushi Bar Kilala is the Unagi Battera (eel pressed with sushi rice). 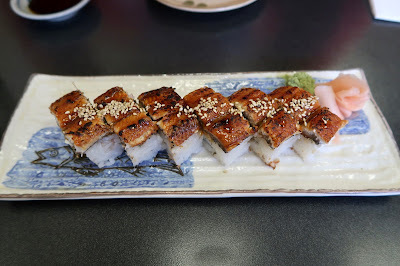 The heavenly smoky flavour of the unagi was accented by sesame seeds and small bits of tamago. I was already full by this point, but I wouldn't have minded eating another order of this if it was placed in front of me. Who says you can't have dessert when you're already full? I went full sugar vacuum mode and opted for the Cream Caramel pudding. The consistency of the pudding was slightly on the thicker side, and it came in a rather generous portion. It was topped with an appropriate amount of caramel and did not end up being too sweet. Overall, we were more than satisfied with the quality of the food and service at Sushi Bar Kilala. 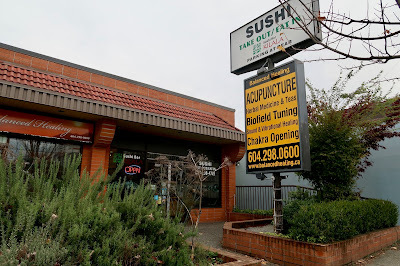 Here, you can experience well-crafted authentic sushi for reasonable prices, as long as you don't mind the very basic decor. The unagi is a must-try and is consistently among the best in Greater Vancouver. I love this place! Super authentic, despite the shabby interior and hidden location. 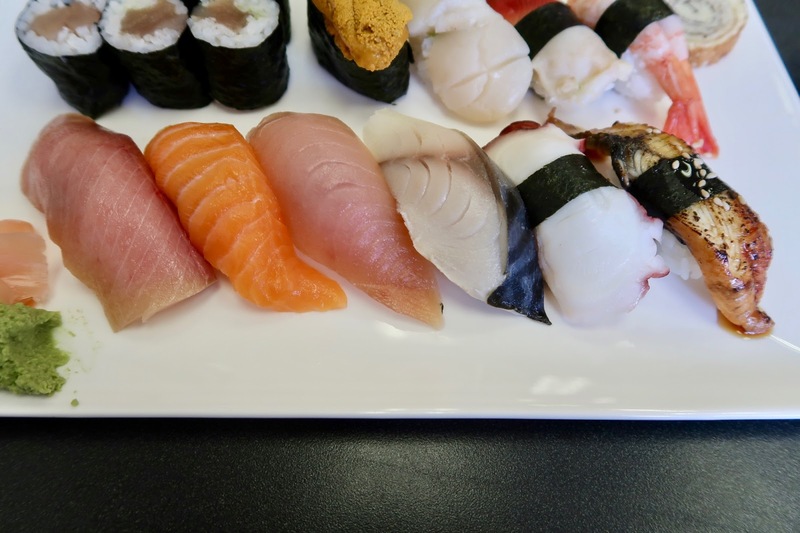 The deluxe nigiri looks so good!